For an optimum electrical contact, the contact pressure between the lower and upper springs may not fall below a given minimum value. After testing, the IC is released by opening the springs by a given distance. Only a very restricted space is available for the contact springs. 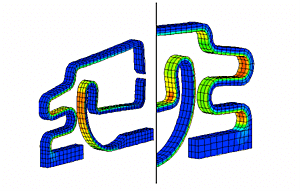 For the original design (top figure), fractures occurred after about 105 and 3.105 cycles for the upper and lower springs, respectively. The minimum number of cycles was projected to 5.105. By comparing the mean stresses and the alternating stress magnitudes for the original design with data from literature, a Smith-Bach-diagram for this special application was derived (bottom figure). 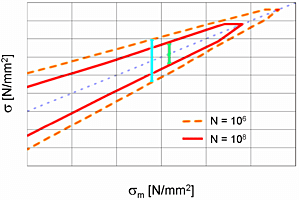 The alternating stress magnitudes have the largest influence on the durability. Therefore, during the design optimization of the contact springs, the main focus was minimizing the stress magnitudes. Simultaneously, the mean stresses were minimized as far as possible. 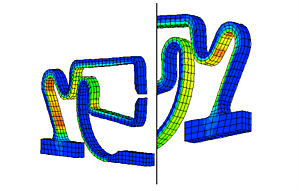 For the optimized design (center figure), the alternating stress magnitudes could be reduced by about 55% and 70% for the upper and lower springs, respectively. In contrast the mean stresses increased by only 15% and 25%, respectively. The number of cycles of survive clearly exceeds the projected number of 5.105 for both spring types. This was validated by operational stability tests. The tests were stopped after 107 cycles without any fractures.